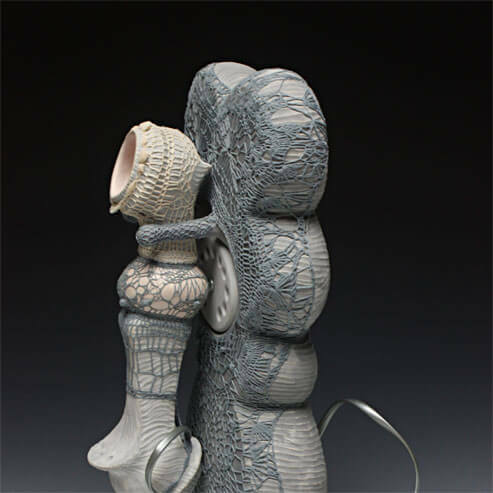 Stephanie Lanter, full-time ceramics instructor at Emporia State University in Emporia, KS, has exhibited her ceramic, fiber and mixed-media sculpture nationally. In addition to completing three-year visiting artist/teaching positions at Wichita State University and Washburn University, she has been awarded residencies at the Red Lodge Clay Center (Montana), The Anderson Ranch (Colorado), The Archie Bray Foundation + Jentel (Montana/Wyoming) and the Mendocino Art Center (California). Her reviews have been published in journals such as Ceramics Monthly and Ceramics: Art and Perception, and she received a Kansas Arts Commission Collaboration Grant in 2010. She received an MFA from Ohio University in 2002 and a BA from Xavier University in 1998. Themes of dysfunction, obsession, absurdity, and balance are embodied in my new clay, fiber and mixed media “fetish phones”. Intentionally “low-tech”, I sculpt these intimate communication/entertainment devices in clay and then playfully and laboriously trick them out with crocheted fiber, wire, beading, or whatever other hardware seems applicable. I combine thought bubble imagery with ubiquitous but unacknowledged cellular/digital terms and symbols (such as “send”, or “OK”), exploring their metaphoric and sensual potential. We are immersed in an exciting but confusing revolution of connectivity, in which speed is paramount and space is an obstacle, but my work is the opposite of virtual. It capitalizes on slowness, inviting viewers to consider how they attempt to fulfill the fundamental need to reach out and touch those around them.